Jolly and Joyful Wendy brings Christmas cheer year-round! 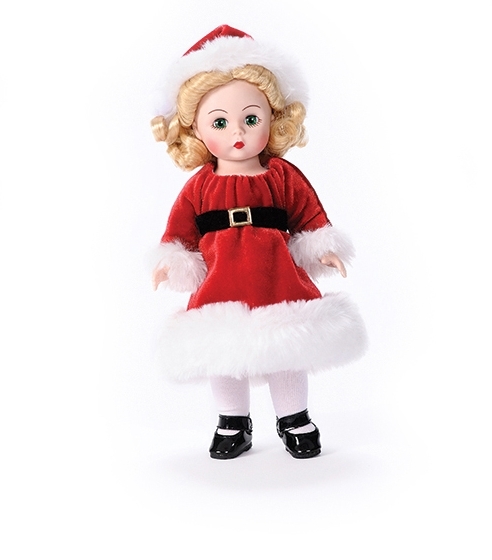 She wears a beautiful red velvet Santa hat and dress with a belt and faux fur trim. She also wears white tights and black patent shoes with ankle straps. Her blonde hair is curled to frame her face perfectly. She features Madame Alexander's classic Wendy sculpt and an articulated, poseable body. Like all Wendy dolls, she arrives packed in the classic blue Madame Alexander box with pink tissue paper. She would make anyone’s holiday happier!